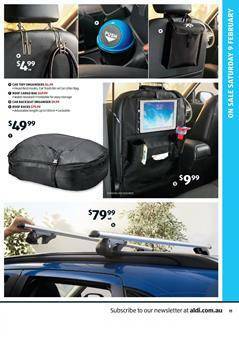 Check out these deals on the latest Aldi Catalogue wherein you may find power tools, cargo bags, organisers for your short or long trips to nature. Amazing things that can be used to camp or stay in your van in nature. Floor mats, caravan step, rechargeable zapper, and more products are on sale within the special buys range of Aldi stores. Go to store on Saturday to see all these deals and interesting prices. Low prices are the policy of Aldi retailing special products. If you like to cook or make some tea during your camping adventure, I recommend you to see the picnicware items which you may buy for the prices on pg 14-15. You may also find small cookpots to use where you stop enjoy nice.